Ryan Zimmerman knew the 2012 Washington Nationals had a good team back in the spring. He acknowledged that they were young but if they could learn from the game and come together as a team that everything would eventually start to click. It’s safe to say now, after years of hard work and determination as one of Major League Baseball’s best third basemen, that Zimmerman was right. The Nats clinched their first-ever National League East division title Monday night despite losing 2-0 against their long-time division rival the Philadelphia Phillies. 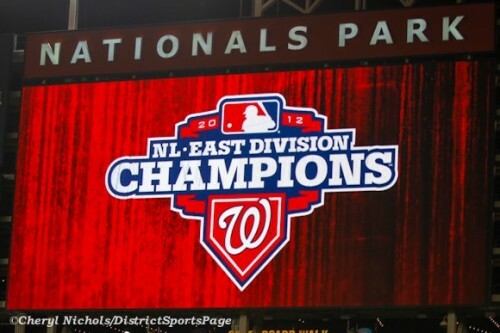 News of the title spread throughout the ballpark via the center field scoreboard in the middle of the ninth inning when the Pittsburgh Pirates beat the Atlanta Braves, thereby securing the Nats’ place as NL East champions. Fans were in a frenzy as Michael Morse came to bat, leading off the bottom of the ninth. They sang A-Ha’s “Take On Me” in unison, as has become tradition at Nats Park when Morse comes to bat later on in the game. The roar of verbal thunder that spread through the Navy Yard air was one to be savored for years to come. 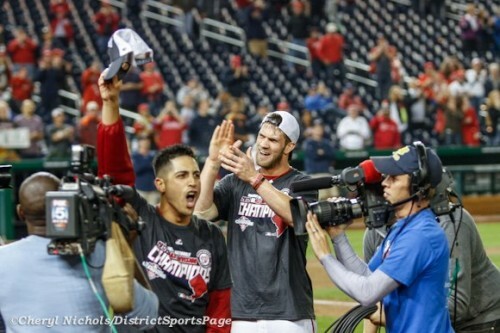 The players brought the celebration to the field from the clubhouse, engaging their fans who’ve waited to see Washington’s transformation into a baseball town. The post-game festivities were a whirlwind of moments strung together as if it were a vertigo haze. Zimmerman and Bryce Harper were caught bear hugging on the field before taking a few pictures with Harper’s pop. Steve Lombardozzi strolled by his teammates carrying around a bottle of champagne with nothing but a satisfied grin occupying his face. Edwin Jackson stood basking in the glow of the stadium lights with his baby in his arms while watching the team’s fans sing their praises from behind the home dugout. Kurt Suzuki looked humbled by the experience. Gio Gonzalez and Morse were bouncing off the walls with that jovial aura that seems to always be surrounding them. But of all the players who had a special connection to the evening at hand, Jayson Werth had a unique vantage point having been a member of Phillies in seasons past. 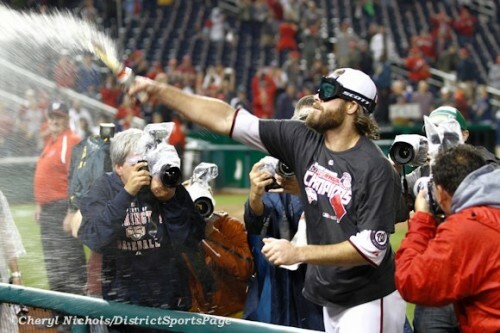 In fact, he was a member of the 2010 Phillies team that clinched the NL East at Nats Park on September 27 in front of a mostly Phillies fan crowd of 14,309. He’s caught a lot of flak from his old team’s fans and pretty much all of Philadelphia but Werth knew he made the right choice by coming to the Nats in 2011.